We have already seen an attempt by Newport Council to criminalise rough sleepers dropped following strong public opposition, including by local Liberal Democrats, however it seems that they are not alone. Freedom of information requests to local authorities by the VICE News website found that 36 local authorities were targeting rough sleepers with Public Space Protection Orders. PSPOs are local regulations which can be used by councillors to ban anything with a “detrimental effect on the quality of life of those in the locality”. In 36 of 78 cases the orders are being used to make activities common amongst homeless people illegal, an analysis by the website shows. There are 375 local authorities in England and Wales. Anyone found in breach of a PSPO has to pay a £100 penalty fine and can face a criminal record and £1,000 if they fail to pay – as a person lacking a home or reliable income might. The paper says: Hackney Borough Council in north London scrapped plans for a similar PSPO after a backlash against the plans. “It is absurd to impose a fine of £1,000 on somebody who is already homeless and struggling,” petitioner Zahira Patel wrote last summer during the row. Housing and homelessness charities including Crisis warned that any move to ban rough sleeping would be “counterproductive”. I agree. Imposing fines on homeless people and persecuting them is pointless. It is far better to invest in support and facilities that will get them off the streets and on the road to recovery. John Rentoul has an interesting column in the Independent in which he revisits his stance on Nick Clegg and the Liberal Democrats. He writes: 'For all the overheated language from the left about inequality, the record of the Coalition was surprisingly good. New figures from the Office for National Statistics last week confirmed that income inequality was unchanged in the 2010-15 period. This is something of an achievement at a time when the Government was cutting public spending, and Clegg is justified in claiming to have tried to balance the books “in the fairest possible way”. He is right, too, to point out that the spending cuts planned for the next four years are very different, with the burden falling on the poor rather than the rich. I agree when he praises Cameron’s “poetic rhetoric” about an “all-out assault on poverty”, but points out that “the deeply regressive steps taken by his Chancellor, means it is insecure, hollow double-speak”. It may be that Cameron and Osborne were happy to be liberals with a social conscience in their first term of government. I thought that was mainly from conviction and from a determination to fight for votes in the centre. But I may have misjudged how leaders respond to pressures from inside and outside their parties. Cameron may be a compassionate Conservative who needed the Lib Dems to keep his own party in order. It is a compelling account of how an unfettered Tory Government is getting on with its agenda of dismantling the welfare state and destroying public services in a way they were not allowed to do when in coalition with the Liberal Democrats. Not only did Nick Clegg get key Liberal Democrats policies such as the pupil premium and the green agenda enacted, he also held back the Tory right wing and forced Cameron to compromise on a whole range of policies. If Cameron had been in sole charge from 2010 it could have been so much worse. Should Independent pay bodies have a built-in social conscience? The decision by the ndependent Parliamentary Standards Authority to give MPs a further 1.3% pay rise on top of a £7,000 a year increase from May last year beggars belief. According to the Guardian, IPSA justify this latest nonsense by saying that the rise is “in line with our determination on MPs’ pay, published in July 2015, where we committed to adjusting MPs’ pay for the rest of this parliament at the same rate as changes in public sector earnings published by the Office for National Statistics." If only the government were that generous to the rest of the public sector. In Cardiff Bay we have a similar situation in which the Independent Remuneration Board has defiied public opinion and that of most Assembly Members by forcing a £10,000 pay increase on those AMs who will be succesfully elected in May. AMs will not be allowed to take less as the money will be automatically paid to them. If they then wish to give it away they can do so. It is almost as if these bodies are seeking to establish their independence by defying public opinion. Nobody really wants to change the system back so that members are responsible for their own pay and conditions again. But I think there is a case for constraining bodies such as IPSA and the Independent Remuneration Board so that they have to give far more weight to public opinion. As somebody who has not been impressed with BT's performance in providing super fast broadband in my region, I have every sympathy with those who suggest that the yesterday's regulatory judgement is the last chance for BT and Ofcom to prove that the industry in its current form and with its current regulatory regime can put customers first and give them the service they want. Ofcom found that Openreach “has an incentive to make decisions in the interests of BT, rather than BT’s competitors”. This “can lead to competition problems”. The people who suffer from those problems are consumers, especially in rural areas, where it is hard or even impossible to get access to broadband at reasonable speeds. Some 2.5 million homes still do not have access to superfast broadband. BT insists that it can and will remedy such problems, admitting there is “more to do”, especially for rural customers. The company is somewhat vague about what that means, but it must include better customer service. It is a fact that connecting remote households to the fastest networks costs more than it does for urban ones. But that does not excuse being slow to answer customers’ concerns. BT’s tight grip on networks may date to its time as a state-owned monopoly, but that is no reason for customers being treated as though they were living in the dark days before privatisation. So say all of us. I am not convinced though that this approach will work either. At some stage Ofcom will need to get tough with BT. Do they have the cojones to do that? With Tory MPs and cabinet ministers split over Europe it was inevitable that the Welsh Conservative Group in the National Assembly for Wales would also be split. And so it proved. There is already controversy because the Conservative leader in Wales, Andrew R.T. Davies has come out for leaving the EU, effectively abandoning the many people in Wales reliant on EU funding and markets. It may not play well with the farming community when they realise the implications of this move. But Andrew R.T. Davies is no Boris, whilst his group do not have the level of influence that can be exercised by the Michael Gove's and Iain Duncan Smith's of this world. Nevertheless, yesterday's vote in the Assembly Plenary was instructive. Believes that Wales and the UK should remain members of the EU and resolves to build a stronger dialogue with European institutions such as the Committee of the Regions. The four opposed were Mark Isherwood, Darren Millar, William Graham and Andrew R.T. Davies. The abstainer was Mohammed Ashgar. We are well used to Amnesty International producing reports on dodgy and restrictive regimes around the World, but it is less common that they turn their attention to the United Kingdom. The UK Government therefore should sit up and take notice. The Independent tells us that Amnesty believes that the UK is setting a “dangerous precedent” to the rest of the world by undermining the human rights of its own citizens at the same time as continuing to supply arms to questionable regimes such as Saudi Arabia. The Conservatives committed to replacing 1998's Human Rights Act with a British Bill of Rights ahead of last year's general election. The Government has yet to unveil the details of the changes, but the UN has described the move as “profoundly regrettable” and has raised concerns that repealing the Act could have an impact on the country's most vulnerable people. The Amnesty report also criticised the draft Investigatory Powers Bill – which it said could “threaten human rights” by opening the door to the mass surveillance of citizens' internet habits and phone records – and the Trade Union Bill, which it said would make it more difficult for workers to exercise their right to strike. The report also notes the UK’s continued reluctance to “share responsibility” for the increasing number of refugees arriving in Europe from Syria, pointing out that it was accepting far fewer people than some other countries, and criticises the Government's continuing arms exports to Saudi Arabia in the face of claims that the country may be responsible for atrocities in Yemen. This is all very embarrassing of course. I wonder if David Cameron is comfortable at being placed in the same group as some of the World's more dodgy dictatorships. How should we be tackling homelessness in Wales? There is an interesting column by Mary O'Hara in today's Guardian on how President Obama is seeking to tackle homelessness in the United States. Having had a few City holidays in the USA I have witnessed the phenomena she describes of 'people living visibly on the streets and in “tent cities”'. It is very disturbing and it is clear that at a state and City level Government in the States there has been a failure to get to grips with this issue. Of course the USA does not have the safety nets that exist in the UK, but even here it is possible to go to some major Cities and see street homeless people in fairly large numbers. In other areas they exist but are not so evident. The solutions to this problem are complex, especially when substance misuse and mental health issues are involved, but it is certainly possible to direct extra resources to deal with homelessness amongst families with children as well as others. In America, President Obama has put in a request to Congress to raise over $10bn in the coming fiscal year budget specifically to help homeless families and children. His Homeless Assistance for Families proposal has been widely welcomed as another sign that homelessness is being taken seriously at a federal level. Mary O'Hara writes: As with anything the president tables it depends on whether Congress agrees to all or a proportion of the funds (and there hasn’t exactly been a cordial relationship between the Obama White House and Congress), but if legislators do accept the proposal what follows could be life-changing for tens of thousands of destitute families. According to the National Alliance to End Homelessness, the proposal could be transformational if enacted over the next few years using interventions such as community rehousing projects that have been proven to work locally “but never adequately funded”. With more than 64,000 families, including 130,000 children, homeless on any given night in January 2015 in the US, the Alliance argues that the extra funding couldn’t come a moment too soon and is a major step towards Obama’s goals to eliminate child and family homelessness by 2020. Nan Roman, the Alliance chief executive, says that the proposal would “give communities exactly what they need to end homelessness for families with children once and for all”. Coming from someone who has worked in the sector for decades and who knows that implementing real change is far from easy it’s a significant comment. What is especially interesting about the president’s proposal, Roman points out, is that the funds will be designated as “mandatory”, meaning the federal government would be responsible for allocating the money and the funding wouldn’t be subject to the vagaries of annual budget renegotiations. Here in Wales we also need an injection of capital to provide enough homes for families and other homeless persons. An Independent report says we need 12,000 new homes a year in Wales of which 5,200 should be affordable. As far as the latter category is concerned the Welsh Labour Government is building less than half that number each year. That is why Welsh Liberal Democrats are proposing to build 20,000 new affordable homes in the next Assembly term. Such a proposal will step up the effort to end family homelessness in Wales. We also need to adequately fund support services for those who do not have a roof over their head because of their chaotic lives and complex personal problems, whilst ensuring that each local council makes suitable provision for emergency accommodation and day services for the street homeless. This is an issue which we can no longer allow to fall down our agenda. Action is needed and it is needed now. We must ensure that the next Welsh Government takes that action. As somebody who is aging rapidly, I may soon get to that stage where I mutter under my breath about the youth of today. However, judging by this article in the Independent, when my generation get to that stage and bemoan the fact that young people are not as they were in our day, it will be expressing astonishment at their virtue rather than their debauched lifestyle. Life on university campuses has changed dramatically over the last 10 years and many unions now provide low-cost vegetables, run their own ethical lettings agencies and provide venues for students’ own academic support groups. Sales of draught and packaged beer at unions across the country have fallen over the last three years, the NUS said, whereas sales of hot drinks are up 11 per cent in the past year. The survey of 1,000 undergraduates found that the most useful services for students were the clubs and societies (60 per cent), advice and support (50 per cent) and café facilities (43 per cent), with only 37 per cent identifying bars as the most useful service. Coffee shops and cafés were the most-used service (87 per cent), the union shop (81 per cent) and clubs and societies (78 per cent) were the services most used by students, ahead of bars (74 per cent). Is it now all about Europe? It was inevitable that, having secured his deal, David Cameron was going to come back to the UK and set the referendum date as early as possible. After all, this is one vote he does not really want and the last thing he needs is open warfare amongst his own cabinet for an extended period of time. However, in setting the date for 23 June the Prime Minister has effectively crashed other people's parties. His decision means that for the next four months all the media will be talking about is Europe. Those of us in Wales, Scotland, Northern Ireland and London, who are fighting elections for devolved administrations are not going to get a look in. Whereas we want people to focus on health, education, housing and the economy, their attention will be drawn elsewhere. That is not a respectful approach to devolution. Obviously we will do our best to break through this background chatter but there is another side to this. Campaigning on the European referendum in areas where there is devolved elections will necessarily take a back seat, so we will be behind the rest of the UK whichever side of the argument we are on. These are not ideal circumstances in which to hold a referendum. Once more internal party considerations have trumped the national interest. 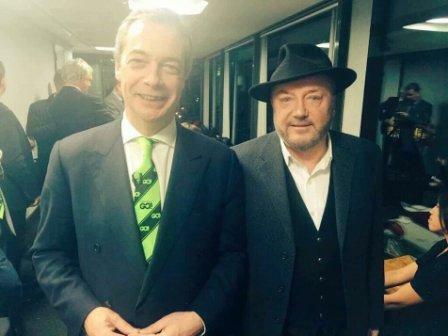 The unlikely sight of Nigel Farage and George Galloway, almost arm-in-arm at last night's anti-EU Grassroots Out rally must have put off many people from the cause they are now locked into together. And according to The Independent their joint appearance certainly has an impact. The appearance of the Respect Party leader prompted shouted complaints from many people at the QE II Centre in Westminster where supporters of Grassroots Out campaign (GO! ), a movement urging Britain’s exit from the EU, gathered as the Prime Minister held negotiations to secure an EU reform deal on Friday. According to reports on Twitter, boos and jeers were heard from the audience as Mr Galloway began to speak, which was dominated by Conservatives and UKIP members. The Telegraph’s Kate McCann said “hundreds of people” left the event with some making comments such as, “This has ruined this as far as I’m concerned,” and “it’s disgusting”.The Telegraph’s Kate McCann said “hundreds of people” left the event with some making comments such as, “This has ruined this as far as I’m concerned,” and “it’s disgusting”. Organisers were witnessed by the Huffington Posts’s Owen Bennett telling security to guards to “shut the doors” to prevent a mass exodus. James McGrory, chief campaign spokesman for Britain Stronger in Europe, suggested Mr Galloway was "the worst special guest since Jean-Claude Van Damme appeared in that episode of Friends". Of course this campaign will throw up strange bedfellows on both sides, but I would be very surprised if we get anything more bizarre than Galloway and Farage making common cause. The good news is that the erstwhile cat impersonator is marmite to many people and his appearance at events like this can only do the anti-EU cause harm. Hopefully, that bad karma will also rub off on Farage, whose judgement continues to be suspect, not least in his choice of allies. Politics Home reports on a complaint after a senior Conservative eurosceptic suggested anti-European Union groups could use front organisations to get around spending limits. The official pro-Brexit group designated by the Electoral Commission has a spending limit of £7m for the campaign, while other groups will have a ceiling of £700,000. As reported in The Times this morning, Conservative MP Mr Baker wrote in an email that Vote Leave would “spend as much money as is necessary to win the referendum” by creating “separate legal entities”. In his letter to the police, seen by PoliticsHome, Mr McFadden called for an investigation as the comments suggested Vote Leave “may breach the law with respect to spending rules”. “I urge you to urgently investigate whether Vote Leave’s clear plan to ‘create separate legal entities’ would amount to a plan to work together with other campaigners in a way that contravenes the Political Parties, Elections and Referendums Act 2000,” Mr McFadden wrote. And he asked Jenny Watson, the chair of elections watchdog the Electoral Commission, to investigate the same comments and “to consider this information” when deciding on which campaign should be handed official status. Mr Baker's email read: "It is open to the Vote Leave family to create separate legal entities, each of which could spend £700,000: Vote Leave will be able to spend as much money as is necessary to win the referendum." Like any community, a political party has its own culture distinctive from others, so it is always instructive to get an insight into how our opponents interact with each other. For Ken Livingstone, it seems his party has changed for the better. According to this interview reported by the Independent, the former London Mayor is far more comfortable under Jeremy Corbyn's leadership than he was in New Labour. “The Labour Party before Blair was a genuinely open, democratic one. Jeremy’s bringing that back. Exactly how isn’t going to be resolved until the annual conference. But that’s what we want back. He said the NEC were looking at lots of different options - including a system where a candidate can get on the ballot with the support of just two other MPs - but he expects an attempt to introduce change at the Autumn party conference. More controversially, Mr Livingstone expressed his support for “automatic reselection all the time”, in contrast to the party leader himself and Shadow Chancellor John McDonnell. On that basis it looks like the control-freakery of Tony Blair's New Labour is being replaced by witch hunts under Jeremy Corbyn. I suspect that many Labour MPs will not be happy with this new regime either. As if they have done enough damage to the health service in alienating many junior doctors, the Conservative Government has added to recruitment problems with new visa rules that will leave overseas doctors “last in line” for specialist jobs. The Independent reports on the BMA's concerns that reforms aimed at making it harder for businesses to recruit from overseas, overlooking British workers, could have “a series of unintended and harmful” consequences for the health service. They have written to the immigration minister James Brokenshire, to tell him that changes, recommended by the Migration Advisory Committee (MAC), could have a “devastating impact” on the 500 overseas medics who graduate from UK medical schools each year. Recommendations from the MAC in a report last month, if drafted into law, would mean that international graduates from UK medical schools would now be subject to the Resident Labour Market Test when applying for a medical specialty. This means they would only be eligible to take part in the second round of applications for specialist training posts, when most have already been filled by UK and EU citizens. Overseas doctors have told the BMA the proposed changes would make it much harder for them to pursue their chosen career path in the NHS. Many would leave the UK to pursue their career ambitions elsewhere, the doctors’ union said. Further proposed changes, which would increase the minimum salary requirement for a tier 2 visa – the type assigned to overseas doctors training for a specialty – to £30,000, could penalise medics who want to work part-time in order to raise children, act as a carer, or study. Between August 2014 and August 2015, 3,602 doctors were granted tier 2 visas to work in the UK. This is going to make things particularly difficult in Wales. Although we anticipate having junior doctors crossing the border to join Welsh health boards rather than stay in England, we also have issues recruiting specialist doctors and could do without further obstacles. Isn't it about time the Government started to get its act together across all departments on the health service rather than creating problems in one department that undermine their aspirations in another? The Telegraph reports that middle-class savers will be "actively discouraged" from putting money in their pensions if George Osborne pushes ahead with plans to cut tax relief for high earners. An analysis by the Institute for Fiscal Studies suggests that if he goes ahead with the plans in his Budget next month tens of thousands of higher-rate taxpayers will be better off investing in Isas or larger homes. It warns that for the first time people who expect that they will still be higher rate taxpayers when they retire would be better off putting their money in an Isa. At present nearly 300,000 pensioners pay the higher rate of income tax, meaning their annual earnings from their retirement pot is over £42,385. At present basic-rate taxpayers receive a £20 top-up from the Government for every £80 they pay into a pension. Higher rate taxpayers, classed as those earning more than £42,385, receive £40 for every £60, while top-rate taxpayers receive £45 for every £55. Under plans being considered by Mr Osborne for a flat rate relief of 25 per cent for all, savers will receive £25 for every £75 they contribute. The move could save the Treasury an estimated £6 billion. The IFS analysis says that at present pension savings are one of the best investments as they are effectively subsidised by the Government, with a tax rate of -21 per cent for higher rate taxpayers. However a 25 per cent flat rate or relief could see pension contributions taxed at 9 per cent, leading to a significantly poorer return than other savings options. The analysis says that someone saving into a pension would need to invest an extra 7p for every pound to achieve the same return as an Isa. The report states: "If the higher rate relief were less than 30 per cent, higher-rate taxpayers who expected to pay the higher rate in retirement as well would be actively discouraged by the tax system from making employee contributions. "As far as tax is concerned, they would be better off saving for their retirement via an Isa or a more expensive home." This will not go down well with Tory MPs, once they understand the full implications of these changes. There is a lot to be said for tradition. Relying on the familiar is one of the ways we root ourselves in our community. Change can be disorientating and disturbing, and may have the effect of separating us from friends, family and neighbours. It is not surprising therefore that, facing a multi-billion pound refurbishment programme that could leave MPs and Lords without offices or a chamber and scattered across London, the Government has said that it will continue to print our laws on calf-skin or vellum. That at least, our legislators will be able to rely on. The Telegraph says that Matthew Hancock, the Minister for the Cabinet Office and Paymaster General, has determined that the thousand-year-old practice of recording Britain's laws on Vellum should be saved in a bid to "safeguard our great traditions." His intervention and his pledging of the Cabinet Office budget to cover the cost, came after the House of Lords said that from April all legislation will be printed on simple archive paper instead of the traditional calf skin vellum to save £80,000 a year. After all we can't have the 'Mother of all Parliaments' resorting to paper like the Scots, Welsh and Northern Irish can we? The question though is whether this is a stay of execution or is Mr. Hancock's decision set in stone for the foreseeable future? After all elsewhere in the paper, we have futurologists telling us what life is going to be like in 2050. For the record, the Adam Smith Institute reckon that today's teenagers living in the 2050s, will enjoy the lifestyles of 2016 millionaires because workers in the UK will be earn twice as much in real terms by 2050 as they do today. Whether this means the elimination of poverty or income disparity, they do not really say. But why no mention of vellum? The controversial Trade Union Bill has hit the headlines again today for reasons that rank and file Tories might be rather uneasy about. The Independent on Sunday reports that the minister steering this bill through the House of Lords has admitted she has only just read the document that set the framework for organised labour and political funding for the past three decades. The paper says that peers were stunned when Baroness Neville-Rolfe, a business minister and former Tesco director, said the first time she had seen a crucial exchange of papers between Lord Tom King and the late Lord Len Murray from 1984 was earlier in the week. Tom King was of course the then employment secretary, whilst Len Murray led the TUC. They agreed what became known as the “Statement of Guidance”. This document ensured that union members were made aware of their rights regarding the funding of political parties, spelling out that they could opt out of having their membership fees handed over to Labour. In return, Lord King agreed not to bring forward legislation that would change the rules around political funding. So, even Margaret Thatcher, whose clampdown on union power was a hallmark of her premiership, stepped back from introducing legislation that would force members to opt in to having their fees used for political funding. The present Tory Government is now considering introducing the opt-in, expected to cost Labour millions in funding. It is interesting that what was good enough for 'Maggie' is no longer sufficient for David Cameron and his Tory party. The influence of big money donations in British politics continues unabated. We have not yet got to the situation in America where elected politicians spend huge amounts of their time raising donations, where lobbying companies dominate legislation and where PACs and Super PACs are able to by-pass funding rules in elections, but you do get the feeling that unless we introduce some rationalisation of the system here, it is only a matter of time before we catch up. The latest revelation is in the soon to be axed Independent newspaper, who report that a right-wing think-tank secured a dramatic shift in government policy, to ban charities from using public funds to lobby, after receiving a ring-fenced donation to promote the change. Cabinet Office minister Matthew Hancock last week announced that the Government was implementing the change and cited the IEA’s “extensive research” on the issue as a principal influence on the decision. The ban has been described by charities as a “gagging clause” designed to restrict their ability to inform Whitehall decisions. The IEA, which has previously accepted donations from tobacco companies while publicly raising tobacco-related issues such as plain cigarette packaging, declined to name the source of the donation, made in 2013. It insisted the money had come from an individual rather than a company and was not used to “commission” research. But the existence of the donation and the IEA’s success in persuading ministers to adopt its proposals, set out in a series of policy papers between 2012 and 2014, will raise questions about the links between the Government and think-tanks, as well as the transparency of the policymaking process. A study last year of 169 think-tanks by the Transparify campaign group gave the IEA the lowest rating for transparency of its donations, describing it as “highly opaque”. Senior charity executives said that it was “highly unusual” for government to announce a significant policy change based on one organisation’s work. Kathy Evans, head of Children England, said: “This is a policy that was announced without consultation – there has been no effort to seek input from those affected. “It raises extremely important issues. I would defend to the hilt the importance of charities being able to provide to ministers and MPs information that goes into the policymaking process. Charities and voluntary groups are often the only voice of those vulnerable groups affected. The irony that lobbying by a thinktank is leading to the end of lobbying by charities is not lost on me of course, but this whole episode raises serious questions about the role of big money in the making of government policy and in the robustness of government legislation. Surely Ministers need to carry out their own research, and take evidence from as wide a spectrum of opinion as possible? Should a comprehensive consultation process not be necessary in all cases? Are councils abusing anti-social behaviour powers? The Independent reports on claims by Home Officer Minister, Lord Ahmad that Councils across the country are abusing powers aimed at preventing anti-social behaviours, using them against people ranging from dog walkers to buskers. But there is mounting concern over the way the orders, which apply to England and Wales, are being used. In the latest of a series of controversies, it emerged last week that under a PSPO by Havering Council, London, parents could be fined if deemed to be parking dangerously while dropping off their children at school. “Local authorities are throwing these things around like confetti,” Liberal Democrat peer Lord Clement-Jones told The Independent. He has written a letter to Lord Ahmad, which is signed by seven organisations including Liberty, the Kennel Club, and the Musician’s Union. The Government’s guidance says that the orders should not be used to ban reasonable activities. “But the consensus of those monitoring PSPO enforcement, and many of those at the sharp end, is that the statutory guidance is not sufficiently clear and is not preventing the inappropriate use of these powers to restrict reasonable activities,” the letter says. And PSPOs are being used “without any prior evidence of significant harm,” it states. I am not aware of any abuses in Wales but am open to correspondence from those who do. I agree with Lord Clement-Jones that guidance needs to be clearer and abuses by local councils stamped down on. Following on from UKIP losing their only Welsh Councillor the BBC report that a petition calling for Nathan Gill to be removed as UKIP Wales leader has been sent to the party's ruling body. "It is understood by all that UKIP in Wales is operated on the basis of mutual respect and understanding," the petition states. "In light of the extraordinary circumstances prevailing and indeed, as a last resort, to prevent further harm and disharmony within 'the party' it is necessary to censure and remove those responsible forthwith." The petition accused Mr Gill of showing "a lack of leadership in all aspects pertaining to this matter". It said that "through his inactivity or unwillingness to resolve the prevailing circumstances, [he] has exacerbated the situation to the point where members no longer have faith in his ability to lead UKIP in Wales in any effective way". UKIP general election candidates backing the petition were Joe Smyth (Islwyn), Darran Thomas (Brecon and Radnorshire), Ken Beswick (Torfaen), Blair Smillie (Alyn and Deeside), Nigel Williams (Delyn), and Paul Davies Cooke (Vale of Clwyd). Nigel Farage is due in Llanelli this evening for Question Time. Assuming he can find the M4 this time perhaps they should ask him about this increasing dissatisfaction in the ranks of his Welsh branch. It is well known that Jeremy Corbyn's determination to change his party's policy on Trident is meeting resistance from MPs and Unions. However, according to the Independent the head of one of Labour’s largest supporting unions has stepped up the pressure and has rebuked Jeremy Corbyn for failing to listen to the “voice of working people” by pushing ahead with his plan to review the party’s policy on this missile system. The paper says that Paul Kenny, the head of the GMB, has warned Mr Corbyn that his union does not intend to “stand idly by” and allow Labour to ditch its support for renewing Trident, a project on which thousands of GMB members will work. In many ways this is more serious for the Labour leader than the resistance within the Parliamentary Labour Group. The Trade Union Bill currently proceeding through Parliament could potentially cut Labour's funding by millions of pounds. If the GMB decide that they can no longer support a party which seeks to put their members out of work, then Labour's financial problems can only get worse. UKIP's only Welsh Councillor has quit the party in a row over the imposition of outside candidates and failed MPs as Assembly candidates in May's election. The Political Scrapbook site reports that Kevin Mahoney, a councillor in Vale at Glamorgan County Council, will now designate himself as an ‘Independent’ in protest at the parachuting in of Farage favourites Neil Hamilton, Mark Reckless and Alexandra Phillips. He is quite explicit in his reasoning: The thought that I would ever sanction the candidacy of Neil ‘cash for questions’ Hamilton, the rejected-by-English-voters-at-the-General-Election, ex-Tory from Kent, Mark Reckless, or Nigel Farage’s very close friend and former PR media spokesperson from Gloucester, Alexandra Phillips, as being suitable persons to make laws that affect us all in Wales is too laughable for words. I have regularly placed on record that, along with the majority of the British public, I despise the political class from all parties. I loathe their sense of entitlement and the fact that they arrogantly view local voters as being there for their own political career enhancement, hence the cynical and parasitical hopping from constituency to constituency, pledging their undying love for any area whose constituency party will accept them as their candidate. I had hoped that UKIP would rise above the political cronyism that has always infected the other parties, but I’m afraid that this is not the case. A senior UKIP source told the Mirror: “The thing with Hamilton is that every time someone tries to flush the s*** down the toilet he keeps coming back up. Surely some of this will stick and start to impact on their support? Can Wales catch up as a super connected nation? Connectivity is the key to a successful economy in the twenty first century and that does not just mean roads, railways and airplanes. We spend a lot of time in the Welsh Assembly talking about the proposed M4 by-pass around Newport, Cardiff airport and the electrification of the main line. All of these are important, but so is superfast broadband and increasingly, the availability of 4G and 3G mobile communications. In both areas Wales is struggling to keep up. The federation warned that the poor state of digital infrastructure was threatening Britain’s ability to take advantage of the “fourth industrial revolution”. It warned that many manufacturers were “fearful poor digital connectivity may prove a drag on future growth”. A survey found that while two thirds reported their connectivity was acceptable, more than half of companies “say connectivity [is] not adequate for future needs”. Half of companies said connection costs have gone up in the past two years. The federation urged the Government to prioritise internet access for businesses, complaining that currently it is too focused on households. Peter Black First Minister, can I draw your attention to a particular problem in my region, in the village of Jersey Marine. They were promised fast broadband by March 2015. They were then promised it again by July 2015. The latest update is the cabinet has been installed for six months but they still have not got it because there appears to be a problem getting the cables across a railway line, which has been there since 1890. This doesn’t auger well for the planning process of BT or their contractors. One constituent who contacted me says he’s a home-based worker, seriously disadvantaged by poor broadband at only 1 MB and cannot take part in video-conferences nor share virtual desktops. What solution would you propose for people in Jersey Marine who require this superfast broadband and are not able to access is? Carwyn Jones - The First Minister Clearly, it is planned for them to be able to access superfast broadband, but if I could write to the Member with further details, perhaps then we could investigate what the problem has been and also to provide a more secure date in the future for those who have contacted him. This is an issue that needs to be addressed with some urgency by the next Welsh Government. Having announced last month that the Tory Government plans to put £140m into redeveloping nearly a hundred of the 'UK’s worst sink estates', the Prime Minister and his Chancellor are at it again with a scheme that will leave many families struggling to afford a roof over their heads whilst signalling a wholesale retreat from social housing in England. The 'sink estates' scheme of course, is just a cover for the redevelopment of social housing in favour of more expensive private homes. The whole plan has many questions hanging over it, not least what will happen to the tenants of these estates and whether alternative affordable homes will be made available to them? That has now been thrown into further doubt by plans to make families or individuals earning more than £40,000 a year in London, and more than £30,000 elsewhere pay a market rent. As the Observer reports, restricting social housing solely to the poorest in our society will mean that tens of thousands of hard-working families will be forced to leave their council homes and find themselves unable to afford a local alternative. It also contradicts the policy of redeveloping 'sink estates' as it will ghettoise social housing, restricting access solely to the low paid and the unemployed. A sustainable and vibarant community should contain a good mix of people within a broad range of economic groups. That will not be possible if access to social housing is limited as proposed by the Tories. The Observer says that a report commissioned by the Local Government Association found that almost 60,000 households in England will be unable to afford to remain in their council properties from April next year, as a result of George Osborne’s reform, known as “pay to stay”. This is because far higher rents in the private sector, and soaring house prices in many parts of the south, means that many council tenants who just exceed the income cut-offs will be left in a desperate position. In total, 214,000 households across England will be hit by the policy, whilst in London most of the 27,000 households affected will be unable to afford to rent privately or buy in the same area. Like the bedroom tax, the justification for this policy is that the taxpayer is paying a questionable subsidy. Putting aside the fact that many affected by both policies cannot afford to pay more, what we are left with is a crude attack on the concept of social housing, an attempt to redefine it as a refuge for the poor rather than the original concept of a secure home for working people. Harold Macmillan must be spinning in his grave. How badly is the Brexit campaign in disarray? Arron Banks, co-founder of Leave.EU, said that the prospect of non-designation had become “a huge worry” and that potentially this could leave the campaign at a disadvantage. The Electoral Commission is expected to nominate a lead organisation on each side of the run-up to the EU referendum which David Cameron has indicated could take place on Thursday 23 June. Both lead organisations will get a grant worth up to £600,000, campaign broadcasts and free mailing. They will also be allowed to spend up to £7m, instead of £700,000, the limit that applies to other registered campaign groups. This will obviously hit the leave campaign if this scenario does come about. My hunch though is that they will be rich enough to do without the state funding. We will see. 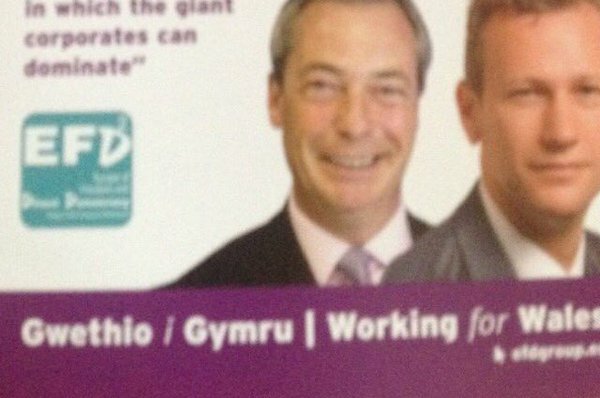 The UKIP candidate selection fiasco took a turn for the worse yesterday when a number of their leading candidates decided that it was all Nathan Gill's fault and called on him to quit as Welsh leader. The BBC say that Joe Smyth, who achieved UKIP's highest vote share in Wales in 2015, said Mr Gill showed "no leadership" during its turmoil over assembly poll selections. They add that another three general election candidates, two standing in May's poll, have also called for Mr Gill to go. UKIP are suffering the travails of being an English Party trying to make an impact in Wales, not made any easier by the personalities involved and their repeated gaffes. The latest is a paid-delivery leaflet that looks like it has been funded by the European Parliament. As can be seen above, even basic Welsh phrases are misspelt. I am told that the Welsh inside the leaflets is also littered with errors. Not an auspicious start to their Welsh Assembly campaign. Can Tories get away with one sided changes to party funding? The Telegraph reports that reforms proposed in the Trade Union Bill, which will ban public sector bodies from automatically deducting subscription fees from workers' wages, could lead to Labour losing £8 million a year from its funding. The Labour Party depends on the unions for millions of pounds in donations every year and under the current system all donations are automatically collected as part of the regular membership fee. However, Conservatives have argued that the approach is "outdated" and leaves the taxpayer with a £6.5 million bill every year to help fund union payments. That may well be the case, however it is clear even to independent observers that this is not about saving the public money but has been politically motivated. I agree with Labour's General Secretary that the measures in the bill are ill considered, unfair and unsustainable. They are an attempt to sneak party funding reform through by the back door to the Tories' own advantage. If we are to have reform of political party funding then it needs to be carried out across the board and should look at all the parties. Ideally it should be taken forward on a non-partisan basis with everybody having an input. Instead we are getting a one-sided change that benefits only the sitting Government. The question is whether the Tories will get these changes through the House of Lords. Peers have already sent these clauses to a sub-committee to be looked at more closely. If that inquiry were to extend its scope then we might start to get somewhere with a more equitable reform. Putting to one side for a moment the claim by the Secretary of State for Wales that Carwyn Jones has effectively abandoned the Union in arguing for changes to the draft Wales Bill, statements by Wales Office Ministers today have underlined the chasm that exists between them and the Assembly on the future of devolution. The Western Mail reports that Stephen Crabb has launched an attack on the “new consensus” he claims has taken root in Cardiff Bay, suggesting that AMs are demanding the “unfettered” freedom to make laws that will have an impact outside Wales. Nothing could be further from the truth. Underscoring his opposition to this view, he said: “Now, that was never the intention of parliament when Labour ministers drafted the existing devolution settlement and nor is it the position of this Government. Mr. Crabb faces two problems with this approach. The first is that it has always been the role of the courts to interpret legislation. If the ruling on the Agricultural Workers Act was contrary to the intention of Ministers then presumably the Government could have produced statements by them made during the passage of the last Government of Wales Act to back that up. The fact they did not suggests that Mr. Crabb's judgement is retrospective and that the Supreme Court's decision was in order. If this is the case then the logical conclusion is that the draft Government of Wales Bill really is seeking to claw back powers and responsibilities currently held by the Welsh Assembly. Secondly, Mr. Crabb's exasperation at the stubbornness of AMs is misplaced. This is not a party political matter. There is a cross-party consensus in the Assembly which includes the Welsh Conservatives. If we are being stubborn, then it because we all genuinely believe that the bill as currently drafted does not represent Wales' best interests. Instead of setting his face against change, Mr. Crabb should work with us to get this right so we can all go on to concentrate on really important matters like the economy, education, health and housing. It was such an obvious solution that I am astounded that UKIP had not thought of it before. Instead of arguing in public as to who should stand for them at the Assembly elections why not let the membership decide? According to the BBC that is now what they have agreed to do. However, they have reached this decision after two damaging rows within their National Executive, who failed to agree a centrally-imposed list because of opposing personal interests. According to UKIP Wales leader Nathan Gill, the decision to give party members the final say is "a great victory". That more than anything sums up the autocratic, centralising, English-centric nature of UKIP. Any party that does not instinctively go down the democratic route for selecting their candidates is suspect in my view. And that is before we take account of their damaging policies on immigration and Europe. Today's Telegraph contains the most scathing attack yet by a former Labour Minister on the new opposition leader, in which he suggests that Jeremy Corbyn is more interested in furthering the interests of minority causes than in uniting the Labour Party behind him. We’re often told (implausibly, in my opinion) that today’s young people are just as enthusiastic about politics as their elders – they’re just more interested in single issues like climate change and anti-capitalist protest than they are in party politics. That sounds eerily close to where Corbyn stands. He needed the Labour Party label in order to get him elected to Parliament in 1983 and re-elected seven times since then. But he is not a tribal politician; he has no emotional loyalty to the Labour Party. Such loyalty would encourage him to mellow his spoken opinions, to search for compromises, to promote the Labour Party at all levels in the understanding that you can’t always get what you want, but half a loaf is better than no loaf at all. Instead he impresses those who voted for him in last year’s leadership election (and no one else) by verbalising every far-Left opinion he has ever held. He doesn’t (he claims) dissemble, he doesn’t prevaricate. He tries to convince himself and those around him that voters will support him because he is honest and principled, even if they’re not impressed by his actual views. He shares with those allies a contempt for the “betrayal” of previous Labour governments: Blair, Wilson, Callaghan – even Attlee approved the UK nuclear deterrent – they were all guilty of betraying the Left. Why would true socialists offer such governments their support? Labour moderates still hoping for a future in the party should remember that Labour’s opponents are not exclusively on the Right. Cameron doesn’t need to conspire to control the Labour Party. The same end is achieved when the cabal with influence over the leader is led by the leader himself. The question is of course whether Her Majesty's Official Opposition can work as an rainbow-causes insurgency. Jeremy Corbyn clearly thinks it can. Only time will tell whether he or Tom Harris is correct.